Elizabeth Ingraham is a sculptor and poet whose work gives form and voice to lived experience. Best known for her series of life-size sewn fabric “skins” sculptures, for which she received the Thatcher Hoffman Smith Award for Creativity, she is also the author of SKINS, a multimedia theatrical performance directed by Kathryn Moller, which debuted at La MaMa Theatre in New York City. 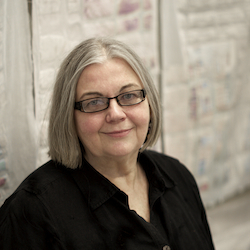 Her multi-year project, Mapping Nebraska, is a stitched, drawn and digitally imaged cartography of the state (physical and psychological) where she resides and includes quilted reliefs of the Nebraska terrain as well as mixed media textile pieces documenting the Nebraskan landscape in imaginative ways. This work was supported by grants from the Hixson Lied Foundation, the Arts & Humanities Enhancement Fund and the Research Council at the University of Nebraska Lincoln and also received the Distinguished Artist Award in 2013 from the Nebraska Arts Council. Recent exhibitions of her work include Picturing Nebraska at the Sheldon Museum of Art and eight other venues, and solo shows at the International Quilt Study Center & Museum in Lincoln, Nebraska, Museum of Nebraska Art and the Kimmel Nelson Harding Center for the Arts as well as exhibitions at the Haydon Art Center, Yeiser Art Center, the Kentucky Museum of Art & Craft and the Fuller Craft Museum. An Associate Professor in UNL’s School of Art & Art History and a Fellow of both the Center for Great Plains Studies and the International Quilt Study Center & Museum, she teaches courses in foundation design and creative thinking. As part of a team with faculty from Computer Science, Digital Humanities, Music and Educational Psychology, she was awarded her second National Science Foundation grant to integrate creative thinking into beginning computer science and other courses. Her research into computational creativity is part of her on-going interest in integrating the digital (pixels and code) with the digital (the work of the hand).